Not sure what everything is? We weren’t either. Thanks to NOLA.com for doing an explanation of the venues. Here’s list of all the participating museums in Louisiana. 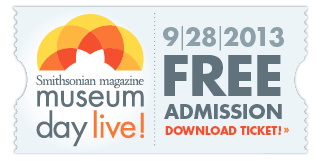 For Museum Day, you get a ticket for two people only. You must print your ticket and present it to receive your free admission. Some places, like the WW2 Museum, will accept a ticket on your smartphone. Header image is of the New Orleans Museum of Art in City Park. Photo by Carlie Kollath Wells/NewinNOLA.com.